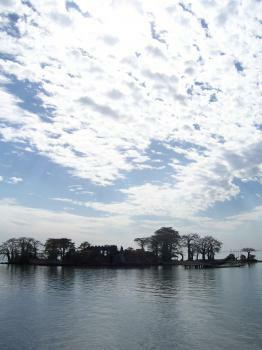 Kunta Kinteh Island (James Island) and Related sites represent the first African-European trade route to the inland of Africa and the beginning and the conclusion of the West African slave trade. They are located along the Gambia River. Having spent five days in The Gambia in early June 2018, it’s easy to appreciate why the smallest nation on the African continent has been nicknamed The Smiling Coast of Africa. I organized two full-day tours with Arch Tours. Since I traveled during shoulder season, I wasn't able to join group tours, so Arch Tours graciously charged me the same price for an individual tour as I would have paid for a group tour -- and traveling in June allowed me to have each site to myself. Each tour company runs a variation of a tour to visit several sites in one day. On Arch's Four Tours in One Day, I visited Serekunda Market, the country's largest (although I later visited Albert Market in Banjul, which seems just as large, better organized and more photogenic); Kachikally Crocodile Pool, a popular destination for women struggling with getting pregnant, who come from around The Gambia to douse themselves in its supposedly curative water; Abuko Livestock Market, the largest cattle, sheep and goat market in The Gambia; and a fishing beach, where the daily catch is smoked or salted under the hot sun. In 1976, Alex Haley published Roots: The Saga of an American Family, where he traces his genealogy back to Kunta Kinte and The Gambia. According to Haley, Kunta Kinte was born around 1750 in the village of Jufureh on the north bank of the River Gambia. 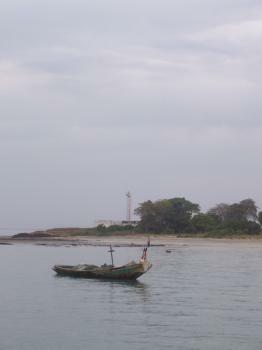 Since the success of the 1977 miniseries, Jufureh has become one of The Gambia’s primary tourist destinations. During my visit, the local guide basically recited as fact the somewhat fictional plot of Roots and shared the stories of his “ancestors” Fiddler, Kizzy and Chicken George. I also met Binta Kinteh, the family matriarch, claiming to be a distant cousin of Alex Haley, who met with him during his first visit to Jufureh in 1967. From Jufureh, I traveled to the river and hired a pirogue, a long wooden boat, to reach Kunta Kinte Island, which was used by the British in the slave trade. According to Roots, Kunta Kinte was among nearly a hundred slaves brought from James Island to Annapolis by the slave ship Lord Ligonier in 1767. I stayed at Luigi's Complex, which is much nicer and personal than any of the large hotels on or near the touristy Senegambia Strip -- but is only a $0.15 bush taxi ride from the strip. Our last full day in the Gambia was spent on a very interesting river cruise that took us to James Island. The island itself is quite small and getting smaller all the time. Erosion by the river has already shrunk the island considerably since the fort became derelict with the outlying buildings all but gone. There are some efforts to protect the banks of the island but the erosion does seem like a very real and pressing concern for the people trying to protect it. The remains of the fort are reasonably substantial; however the British bombarded the fort when they stopped using it so it is in ruins. The island was used as a holding pen for captured slaves before they were transported to Gorée in Senegal and then onwards to the Americas. It was an incredibly small area that was set aside for the slaves; however the Barracks in which they were held was the first to be washed away by the encroaching river. Therefore whilst it is still quite a harrowing site the full gravitas is somewhat lost as you can’t see the conditions in which they were held. The one complete room that is left on the island is commonly referred to as the slave dungeon, it seem that this wasn’t the case and it was a store room, however it is very indicative of what the barracks would have looked like so gives some idea of the miserable conditions. The ‘associated sites’ that are also included in this site actually add quite alot to it. Four of them are located on the north bank of the River Gambia in the twin villages of Juffreh and Albreda. They show help to show the administrative and mercantile background to the slave trade. They are easy to visit as you will have to get to these towns to get out to James Island. Most of them are in ruins; however the Manuel Ferres building contains a good small museum about the history of the transatlantic slave trade. The sites at the mouth of the River Gambia, Fort Bullen and Six Gun Battery illustrate efforts that were made to limit the Slave trade following its abolition in Britain. This again adds another dimension to the site. It is actually a pretty easy place to get to as it is on the highly popular ‘Roots’ tours that are run from the touristy areas of Western Gambia. I was a little sceptical on how good these would be but they were actually very interesting and the guides we had for the trip as well as in the villages of Juffreh and Albreda. It was a very relaxing way to spend the day cruising along the river. Many tour operators offer the trip however you will probably end up on the same boat so it pays to shop around. We went with Tilly’s Tours who turned out to be very good and the cheapest we could find. The guides were very friendly and informative and have a fairly ethical outlook. This was a great day trip and a very interesting WHS, the inclusion of the ‘associated sites’ show the many different facets of this awful and hugely important part of human history. Certainly worth a trip even if it is the only one you make from the touristy parts of the Gambia. As Paul states this is a bit of an oddity. It is already inscribed as one of the "Associated sites" of the James Island WHS. 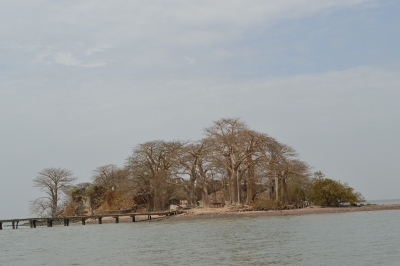 It is located in Barra, which sits opposite the capital Banjul and is connected by a very busy ferry route. The fort is located a short distance from the ferry port but the road is quite poor and very sandy so it is tough to get nearby motorised transport, so it is probably best to approach on foot is you have a wait for the ferry. There is not a huge amount to see at the fort just the old walls and a few scattered cannon. This actually is really good addition to the James Island site. It transforms this from being just a holding pen for slaves into one that shows the evolution of the Slave Trade and also the battle to control and eradicate it. Fort Bullen was built in 1827 at a similar time to the six gun battery in Banjul. This enabled the British to control ships coming in and out of the River Gambia and help to enforce the abolition of the slave trade. 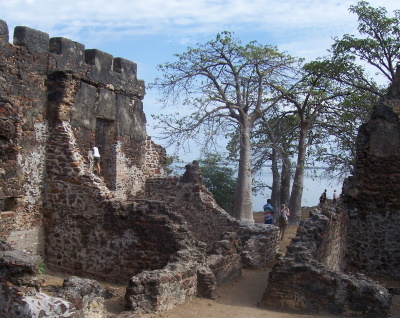 Whilst Fort Bullen is not a massively impressive site its incorporation into the Wider James Island WHS helps to illustrate the evolution of slavery on the River Gambia. I don't understand why this site is still on Gambia's T List as it is ALREADY inscribed (2003) as part of James Island. It was put on Gambia's T List in 1993 and has either been "forgotten" (Gambia is not the only country still to have on tis T List sites which have been inscribed)or has been left on so that Gambia still has "T list"! Built or owned by Dutch: The Dutch briefly held the fort from 1659 until the British captured it in 1661. Named after individual people: "Kunta Kinte (sic)- the fictional, or possibly genuine, Mandinka slave ancestor of Alex Haley as described in "Roots - the Saga of an American Family"